The graphic for this post is of an acrylic on canvas I completed last year. 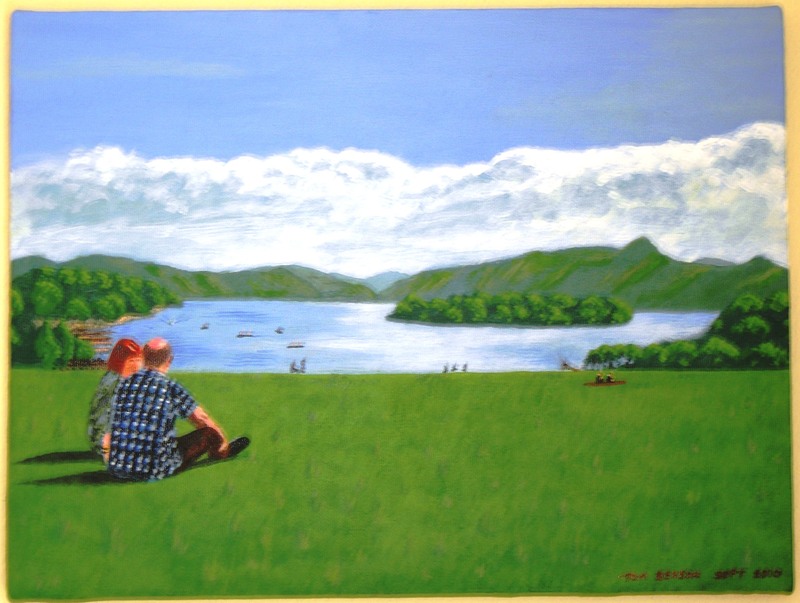 It depicts myself and my wife sitting on a hill overlooking Derwent Water in the Lake District. I used a photo taken by our son as the basis for the painting. Apart from being a fellow artist I think he’s pretty handy with a camera and has an appreciation of good photo composition … but then I’m biased. Since my last entry here I’ve allowed ‘life’ to infiltrate my writing world. A home improvement project which had to be done in logical sessions took up a lot of time, but the finished result is like looking at a good piece of writing. It would be selfish of me to concentrate only on my writing so I don’t mind the occasional sacrifice of some time. Making matters worse for my time at the keyboard, work took it’s toll because it’s the busiest time of the year for stationery retailers, so I was left feeling too tired to write anything worthwhile. It was a couple of days before I realised I wasn’t writing on my train journeys – preferring to concentrate on staying awake. It’s over a year now since I last dozed off on the journey home, thus adding another ninety minutes to my trip. So here I am, back at the helm, controls, bridge or whatever is the best analogy. On the odd occasion when I have been relaxing I’ve managed to upload some poetry, a short story and a variety of my artwork to the ‘Apollo Blessed’ site. Like all good sites they appear to be a nice bunch of creatives. I do like the idea of stories, poetry, art, photography and music all being treated as ‘art’, rather than a single strand of work being concentrated there. Like myself there are several folk who like to express themselves with more than just words.